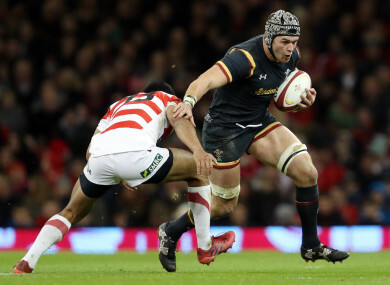 DAN LYDIATE WILL miss the Six Nations after the Ospreys confirmed the Wales flanker needs surgery to fix the bicep injury sustained against the Dragons. Lydiate left the field during the New Year’s Eve Pro14 clash at Rodney Parade but was only expected to miss six weeks. However, the 30-year-old will miss the rest of the current season after being told he requires an operation to correct the problem, thus ruling him out of contention for Wales’ Six Nations campaign. “After speaking to consultants and seeking specialist opinion, the decision has been taken in Dan’s best interests to undergo surgery,” said Ospreys medical performance manager Chris Towers. The news is a huge blow for Wales with captain Sam Warburton and fellow forward Taulupe Faletau already ruled out of the Six Nations, while Hallam Amos remains a doubt. Wales kick off their campaign against Scotland in Cardiff on 3 February. Email “Another injury blow for Wales as Ospreys flanker ruled out of Six Nations ”. Feedback on “Another injury blow for Wales as Ospreys flanker ruled out of Six Nations ”.